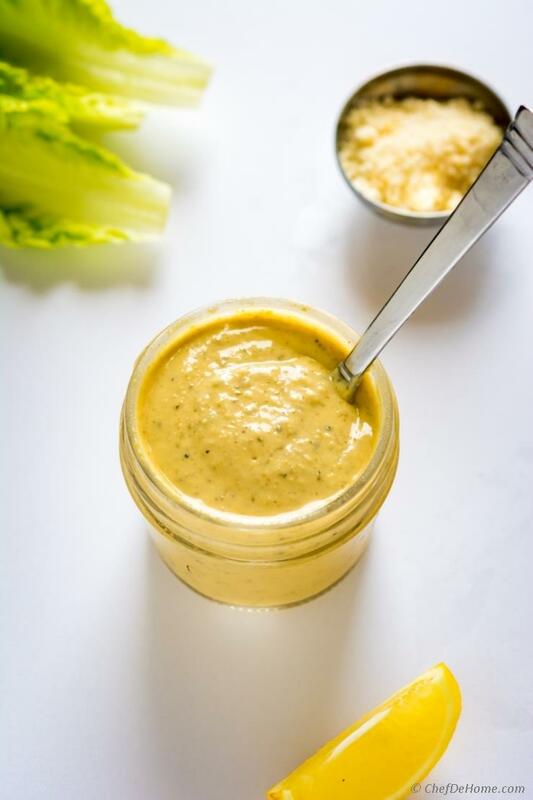 This Caesar dressing recipe will be the only recipe you will ever eat for rest of your life! I know! Big promise? Well I'm not saying that for nothing.. I really mean it! What are the odds that this is also a vegetarian Caesar dressing! No eggs, no mayo, no fish products.. and still a creamy, garlicky and flavorful dressing with briny capers, nutty parmesan, tangy mustard, and lots of black pepper. Recipe for caesar dressing is not so complicated but I often not able eat any in restaurants due to mayo and anchovies. 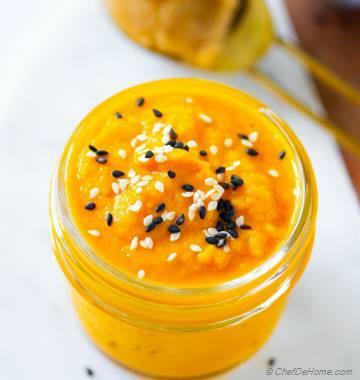 So, I make some easy replacements to whip a batch of vegetarian version which is as delicious as classic.. actually even better and good for you! Also, it stays good in refrigerator for up to a week. I like to make big batch during weekend and then use it on almost everything! I must tell you that not just Caesar Salad, this dressing also works PERFECT on grilled/steamed vegetables! If you are new to Caesar Salad and what goes in it?! Let me share, a few words about this Italian masterpiece! Well, answering this reminds me of Gieco's new advertisement.. where Caesar salad comes with king Caesar standing in salad bowl. LOL! Caesar Salad is a salad of Italian (Roman) origin. The classic ingredients for Caesar salad are crunchy Romaine lettuce, bread croutons, Parmesan cheese and an anchovy-garlic Caesar dressing! In many recipes, mayo is used as creamy base. Also, Worcestershire sauce is added for complex deep flavors. This vegetarian, mayo-free and fish-free Caesar dressing not only gives me option to enjoy Caesar salad! It also comes in handy when we are on meatless diet. Like these days, we are observing 9 days of Indian festival - Shub Navratri. During this time, we only eat vegetarian. So, during this time we turn to strict vegetarians, from salad to dressing.. everything plant based. Dairy is okay. So, my dressings get creaminess from yogurt, buttermilk and creams. Oh, I have an another version of Vegetarian Caesar Dressing - actually, my three ingredient dressing. This one I use when I crave Caesar Salad but only have a few ingredients in hand. In post, I paired it with a Kale Caesar Salad. See, now even if you are vegetarian, you can try Caesar Salad! At home! Actually, did you know restaurant version has fish and egg ingredients?! Why Best Caesar Dressing Ever! 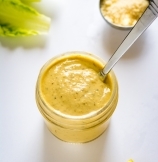 This Caesar salad dressing is going to blow your mind! It is that good! You know, I love creating my-version of flavors I eat out! Right? What I love even more is: to share those with you! This dressing is by-far on my best recreation ever! I made some simple and healthy substitutes for fish and egg ingredients. Wasted a couple of batches before I could relate to the taste of real dressing. Above all, my not-ever-veggie-fan husband approved it. It means a WINNER in my dictionary! 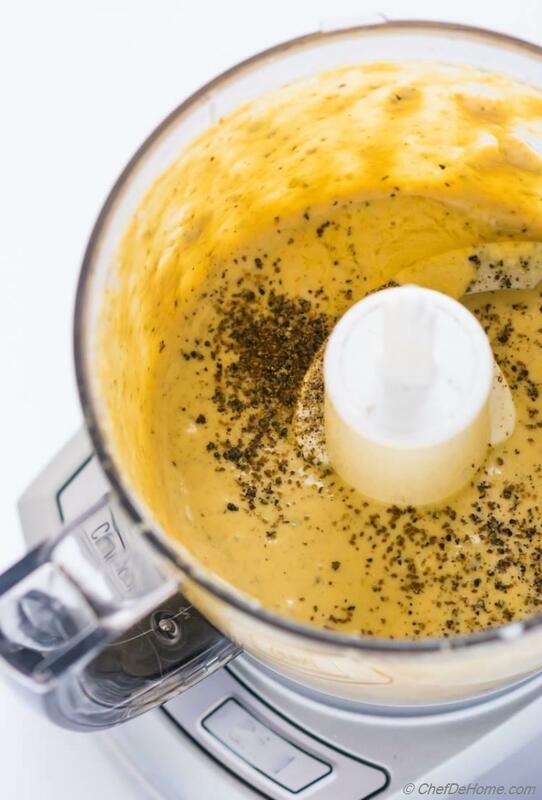 Bookmark this Caesar dressing recipe because your search for best recipe will end with this! Give it one try with my lettuce cucumber salad.. and you will have a batch of this in your refrigerator for next week. Just remember t use good quality parmesan cheese! PS: The cute little crouton boats! That is my idea to serve Caesar Salad for Cocktail Parties. (nice and pristine) Recipe for making crouton bowls is in notes. 1. 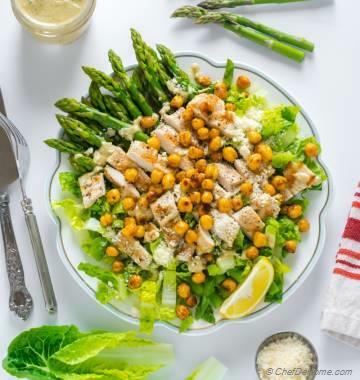 Caesar Salad Dressing: In a food processor, add lemon juice, mustard, parmesan cheese, soy sauce, capers, olive oil, and buttermilk and garlic cloves. Pulse to make smooth puree. Mix in fresh cracked black pepper. Set aside. 2. To assemble salad, wash and spin-dry romaine lettuce. Slice big leaf into half. 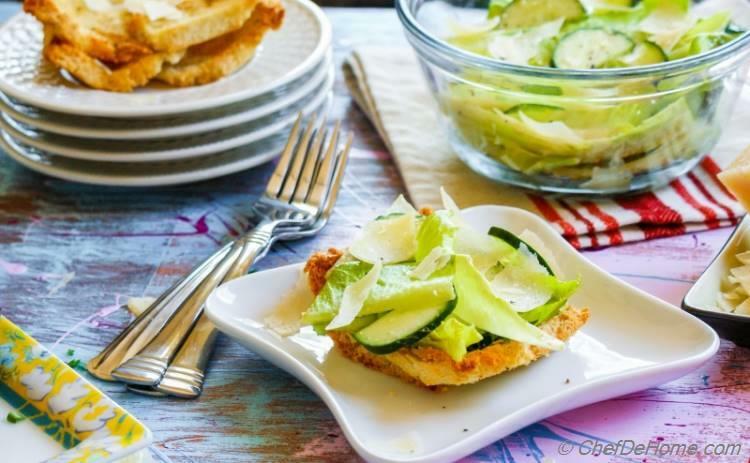 Shave parmesan wedge using vegetable peeler. In a large salad bowl, add romaine lettuce, cucumber, and half of the caesar dressing. Toss gently to combine. Top the salad with shaved parmesan. Serve remaining dressing on the side. Enjoy! To bake croutons, preheat oven to 400 degrese Fahrenheit. Heat oil in a small sauce pan, add minced garlic, let oil perfume for 30 seconds, then remove from heat. Set aside. Wet your hands, take one slice of bread and press the bread in pie-tart shell, giving shape of a shallow boat. (using wet hands will help bread take the shape easily.) You can also use muffin tin for a cup like shape. Repeat for all 5 bread pieces. Brush garlic oil on each slice and then add some pie-weights or dried beans. Bake in pre-heated oven for 10 minutes, then remove pie-weights and continue baking until bread is brown and crispy. This was FABULOUS!!! I haven't missed many things since going vegetarian, but I really have missed Caesar dressing. I doubled the recipe, which made about a pint of dressing and lasted me most of the week. I found myself eating salad just to enjoy the dressing. Thanks for posting! Angela, thanks for sweet feedback. 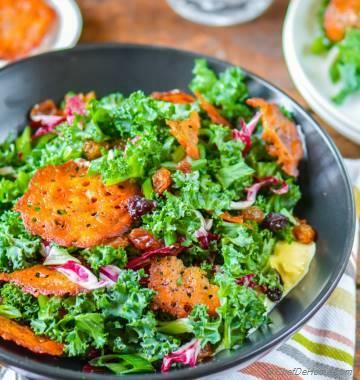 This is one of my favorite vegetarian dressing as well. I'm glad you enjoying it. I'm happy to share. Just curious about the Parmesan cheese since it is not considered vegetarian, based on the animal enzymes used in it. Would you recommend any substitutions? Hi Kaitlyn, these days lot of commercial cheese are made without animal enzymes and are labeled “vegetarian”. If you can get hold of vegetarian parm or even feta/queso fresco that will be great. Or 1) nurtional yeast 2) cashew soaked in hot water for 10 minute, drained and pureed (add some liquid aminos or salt to compensate for salty parm) can be close substitutes. I hope it helps. Finally it can print on the different computer. I’m looking forward making the vegetarian Caesar dressing. Thank you. why does it not let me print this? I clicked the print and nothing happens. I feel you block me. Hi Sandra, I did not block anyone. Please try pirint from your browser’s - File Option. If it does not work. Let me know, I can send you a printable copy on email. We regret for inconvenience it may have caused.